We have good news for those candidates who have participated in the Railway Police Force Constable/SI Examination 2018-19. As we know that the Railway Police Force has successfully held the RPF Constable & SI Examination in the month of December to January. In Railway police examination, male and female both divisions aspirants have engaged. Constable Examination for Group C & D is to be scheduled on 6th February 2019. The authority has declared RPF SI Group E & F Result 2018-19 and RPF Constable Group E Examination Result. As we know, the examination was conducted as per group wise (A to F) on individual dates. Now, the authority has decided to declare the result also individual for each division. 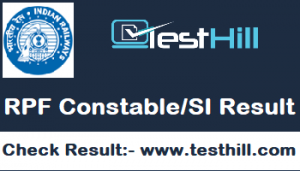 Appeared candidates can check their result now RPF SI Result from https://si.rpfonlinereg.org/ and RPF Constable Group E Result from https://constable.rpfonlinereg.org/home.html or you can check it directly from www.testhill.com. We are going to provide the direct link to check RPF Constable/SI Result.